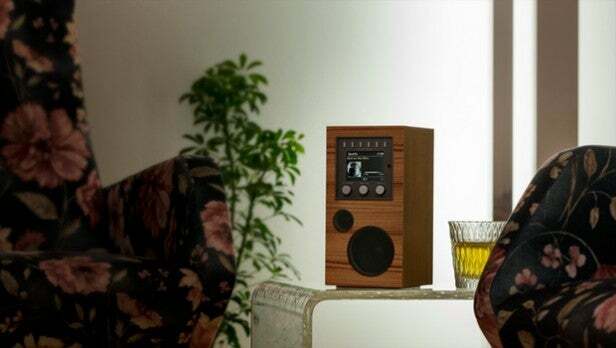 Fashionable design and high-quality sound get this streaming speaker in the door; its ability to tune in everything from FM radio to Spotify and internet radio will convince you to take it with you. 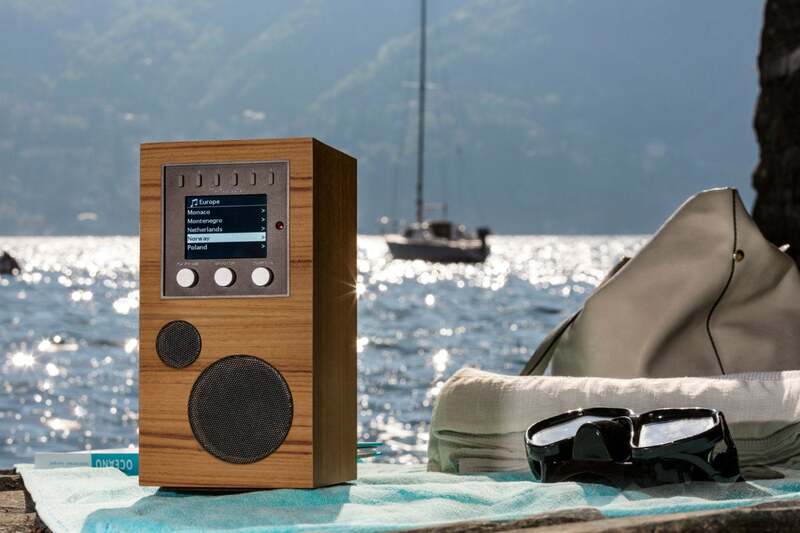 The Amico sounds fabulous, and it boasts lots of features not typically found on streaming speakers, including a teak veneer finish, onboard controls, battery power, and a color display. Just be prepared to pay for it all. Amico means “friend” in Italian; also “little buddy.” The term is often applied to puppies, but I found it appropriate for this well-crafted speaker from Como Audio that’s been trailing me in and around the house for the last few weeks. Whether running on battery or AC power, the Amico happily ran on a long radio-frequency leash, with an operating range of more than 100 feet from my Xfi Advanced Gateway Wi-Fi router, and 30-plus feet from my Android and iOS smartphones and tablets via Bluetooth (with NFC and aptX codec support, no less). 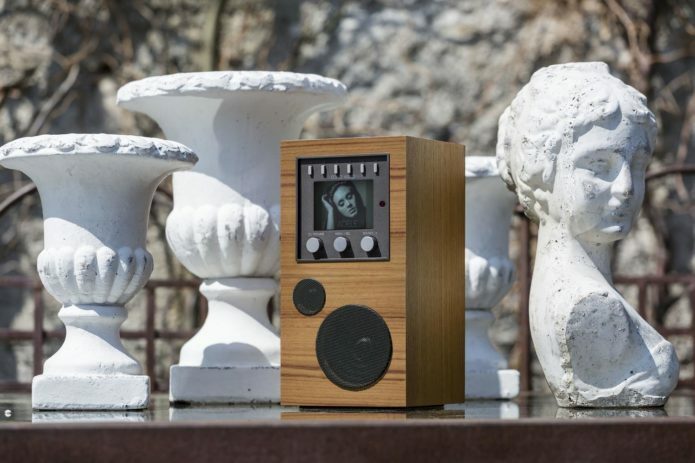 As an internet-connected music device, the Amico cavorts literally thousands of miles away from its content buddies to entertain and make time fly. It can also stream from DLNA servers (e.g., a NAS box) on your local network. Deceptively demure in design, though loaded with features, the Amico is fitted into a handsome teak veneer cabinet. It boasts a full-color LCD display, three multi-tasking aluminum control knobs, and six programmable channel-selection buttons for your favorite internet (via vTuner) and FM radio stations. Those presets can also be used to save and recall specific tunes, albums, and playlists on Spotify (a Como Audio representative tells me a firmware update will render these presets compatible with other paid streaming services later this year). The Amico’s full-color display can show lots of useful information, including album art for whichever track is currently playing. The Amico is clearly meant to spend most of its life in a pampered, upscale home environment, plopped on a nightstand, bookshelf, or granite kitchen counter by doting adoptive parents who won’t blanch at its $399 price tag. Using the Como app enables you to set up a multi-room audio system with other wireless speakers from the Como Audio stable, including the disc-playing Musica (our review is in the works) as well as other Amicos. While it doesn’t carry an IP rating for water ingress, the Amico’s teak veneer and marine-grade plywood substrate render its cabinet at least moisture resistant. A clever dual-purpose scoop on the back of its enclosure doubles as bass port and grab ‘n go hand grip. An included 2200mA rechargeable Li-Ion battery enabled my review unit to run for more than nine hours at a reasonably lively (mid-level) volume, slightly better than Como’s claim of eight hours of continuous playback on a full charge. For more serious traveling, Como offers optional soft and hard cases to pack the Amico alone or with a wired $129 companion speaker called the Amica. The Amica is sonically matched to the Amico, being equipped with the same cabinet dimensions and drivers; namely, a .75-inch soft dome tweeter and a 3-inch, long-throw, 4-layer voice coil woofer. Plug in the 15-foot connecting cable, flick a switch on the back of the Amico, and you’ll transform the mono music maker into a compact stereo system while doubling the Amico’s combined power output to 60 watts. 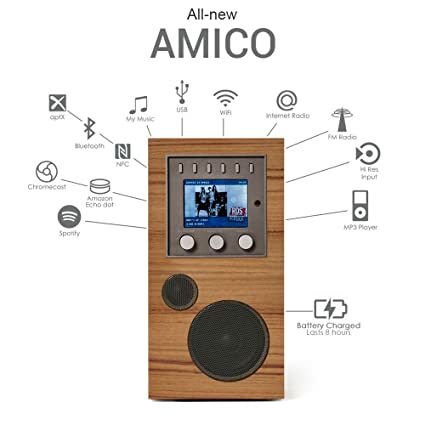 Globe trotters should take note: The Amico marketed in the U.S. lacks the DAB/DAB+ digital radio tuner found in European models. And if you take the speaker to other locales, you’ll need to swap the power plug tip. Como Audio’s smartphone app provides the essentials, and a little more if the streaming station encodes artist and track information. The Amico is not without quirks. Station presets can only be established by physically pressing one of the six available channel buttons while you’re listening to that station; you can’t do the assigning on the app (the way Bose SoundTouch streaming radios with presets work). Switching presets using the slow-to-respond mobile app, meanwhile, entails digging a couple layers deep. More frustrating, I haven’t figured a way to use the Amico’s remote control to switch from one channel preset to another. 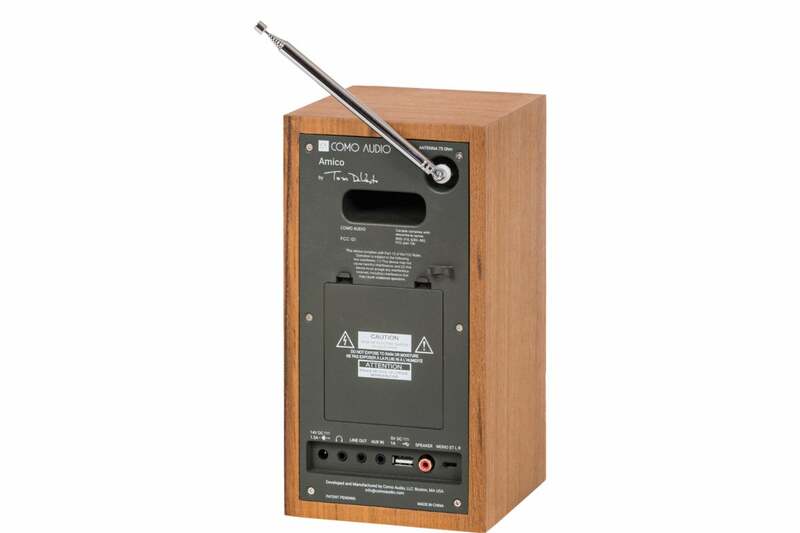 The remotes for some otherComo models—including the Musica—have direct-tune buttons. And if you prefer to use voice commands to change stations, you’ll need to wait for the Google Assistant-powered Amico variant called the Speakeasy. Como’s wireless speakers devices in general seem to demand a more robust, drop-out-free Wi-Fi signal than many of the competing devices running in my house (models from Bose, Pure, Sonos, and Ultimate Ears among them). On the upside, the slow connect and buffering issues I was experiencing with the Amico (and the Musica) early on in the review cycle encouraged me to upgrade my router to the aforementioned model. Most problems subsided after the gateway switcheroo. Listening as I write to Keith Jarrett rustling “Autumn Leaves” on grand piano, whilst Gary Peacock rakes his standup bass strings and Jack DeJohnette brushes sunlight off his cymbals, I’m struck again by how accurately acoustic instruments are represented by this streaming speaker, which is always the acid listening test for me. 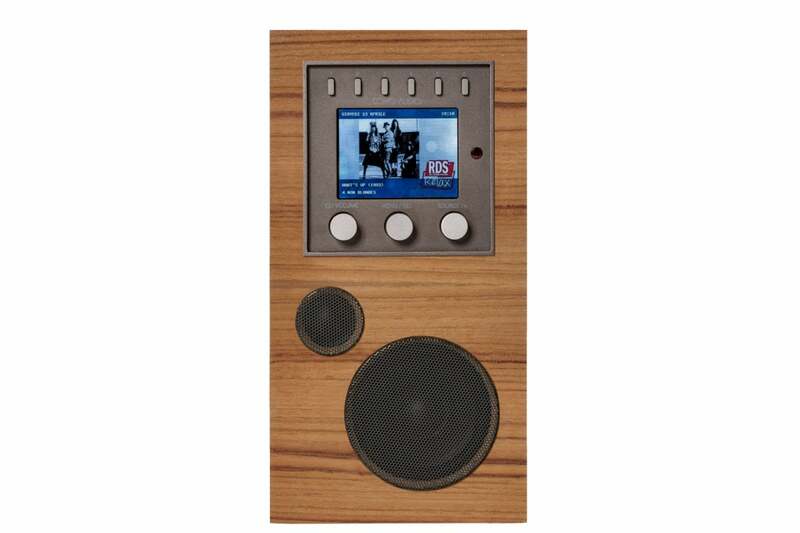 As much as I appreciate the color screen, the preset buttons, the handsome Bauhaus wooden cabinet, and how fun the Amico is to take for a walk, its audio performance is ultimately the factor that renders it worthy of its asking price.